Seven lakes received special stockings of crappie and redear sunfish this fall in an effort to establish or bolster existing fish populations. Lake Cumberland received nearly 219,000 fingerling-sized redear sunfish ranging in size from 1 to 4 inches. 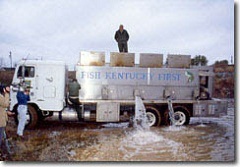 Employees of the Kentucky Department of Fish and Wildlife Resources put these fish in the Beaver, Otter, Lily and Caney creek areas of the lake. Redear sunfish are also referred to as shellcrackers. "Redear sunfish like vegetation, timber and brush," said Gerry Buynak, assistant director of fisheries for Kentucky Fish and Wildlife. "When the lake comes back up, we hope it will be ideal for them. We want to provide a really nice panfish for people to enjoy." Yatesvillle and Fishtrap lakes both received 20,000 fingerling redear sunfish last year, and again this past September. The fisheries division began stocking Dewey Lake in eastern Kentucky with redear sunfish in 2007 and continued until 2010. They placed over 500,000 fingerling redear sunfish in the lake. "A fishery for redear sunfish has developed in Dewey Lake with good numbers of 10- to 12-inch fish available for anglers," Buynak said. The fisheries division also stocked 20,500 blacknose crappie in eastern Kentucky's Paintsville Lake. Blacknose crappie have a distinctive black bar extending from their mouths to their eyes. Stockings from east to west included Carr Creek Lake, which received 3,800 white crappie; Taylorsville Lake, 20,900 white crappie; and the Blood River arm of Kentucky Lake, 177,800 white crappie, roughly 46 fish per acre of water. "We hope these stockings improve the crappie fishing in these lakes," said Ron Brooks, director of fisheries for Kentucky Fish and Wildlife. "Crappie are a popular sport fish for anglers in Kentucky. We want to provide anglers with as much crappie fishing opportunity as possible." These stockings should lead to better fishing for crappie and redear sunfish in these lakes for Kentuckians to enjoy in the coming years.